Found in FNA Volume 19. Treatment on page 537. Mentioned on page 536. Plants (2.5–)5–20(–26) cm (more in fruit). Stems not branched. Leaves mostly basal (cauline to midstem at most); basal and proximal: petioles 4–50 mm, blades cuneate to spatulate, 6–30 × 4–16 mm, mostly 0–3-lobed; cauline: petioles 0 or 10–25 mm, blades 4–23 × 1–8 mm. Heads 1(–2), 13–20 mm diam. (flattened, excluding rays). Peduncular bracts 6–12 × 1 mm. Ray laminae (7–)9–18(–21) × (1.5–)1.8–4.3 mm, veins 4–5(–12). 2n = 18. Man., N.W.T., Nunavut, Ont., Que., Yukon, Alaska, arctic Russia. In North America, subsp. polare ranges more or less continuously from St. Lawrence Island and the Seward Peninsula (Alaska) in the west, to the Ungava Peninsula (Quebec) in the east, along the low arctic continental coast, the coast of Hudson Bay, and the southern coast of the lower islands of the Arctic Archipelago. 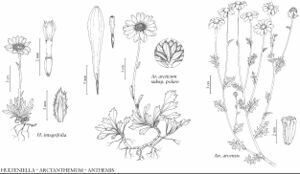 Facts about "Arctanthemum arcticum subsp. polare"
This page was last edited on 2 January 2019, at 20:45.